The third and final day of the Dunlop British Junior Championships 2018 saw 10 players crowned across seven English counties as the junior tournament in Nottingham drew to a close for another year. Winning performances from Scotland’s Georgia Adderley and Ireland’s Denis Gilevskiy also ensured that their respective countries topped the podium on one of the most prestigious tournaments on the junior squash circuit. The top two seeds from each age category dominated each of the finals – with Lewis Anderson and Emma Bartley the only third-seeds to contest for silverware on the final day of the competition. And it was Warwickshire’s Anderson, last year’s BU17 champion, who pushed Yorkshire’s Nick Wall all the way in a five-game epic in the BU19, before the Yorkshireman secured his maiden BU19 title. Wall recovered a two-game-to-one deficit – and defied a resurgent Anderson – to secure an 11-8, 8-11, 9-11, 11-3, 11-9 victory in his second appearance in as many years in the age-grade final. The result saw Wall justify his top seeding in the tournament – and walk away with the title after finishing runner-up in last year’s tournament. 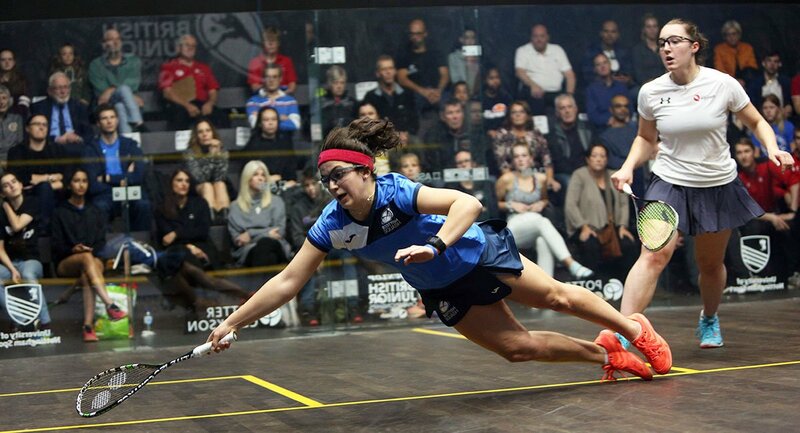 “I didn’t play my finest squash but I was happy that I still managed to get the win,” said Wall. Essex’s Alice Green was denied the GU19 title by Scotland’s  Adderley, who added to her GU17 crown last year with an 11-4, 11-8, 5-11, 11-7 triumph over top seed Green. “I’m really happy to win my second BJC title and overall, I’m really pleased with how the event went,” said Adderley. Meanwhile, Middlesex’s  Margot Prow stormed to the GU17 title after beating top seed Maia Pannell (Hamps) in straight games, recording a 13-11, 11-7, 11-7 win. Ireland’s Denis Gilevskiy powered to an enthralling five-game triumph over Sussex’s Jonah Bryant in the BU15. The Irishman defied a comeback from a valiant Bryant to secure a 12-10, 11-5, 9-11, 8-11, 11-9 win. And Sussex’s  Torrie Malik tasted victory in the GU17 after overcoming Sulfolk’s  Emma Bartley 11-6 11-3 11-7. Yusuf Sheikh took the BU13 title after battling from two games down to overpower third seed Abd-Allah Eissa (Warks) in a five-game thriller. Essex’s Sheikh recovered a two-game deficit after going down 12-14, 5-11 to win three consecutive games 11-7, 11-9, 11-5 and secure his maiden BJC crown. In the GU13, second seed Amelie Haworth added to the English junior title she won in March with an impressive win over current England number one and the tournament’s top seed, Meha Shah (Warks). The result sees Hampshire hitter Howarth power to her maiden British title, after securing an 11-7, 11-1, 11-9 victory. Surrey’s Ronnie Hickling claimed the BU11 title with an 11-3, 11-9, 11-5 win over Berkshire’s  Dylan Kalar, while second seed Mariam Eissa (Warks) was victorious in the GU11 final, edging out top seed Emily Coucher-Porter 11-9, 8-11, 11-7, 11-1 to take home her first title.